Lucas Puig really came onto the international scene as part of Lakai’s French Connection in many of their videos, with a memorable part (frontside smith to kickflip primo) dropping in Lakai’s Fully Flared video in 2007. Since then, he has only progressed further and further into maturing his selection of tricks, style, and also companies. After leaving Lakai in 2010, he was picked up by adidas skateboarding, and had also started his own cap company, Helas, with long-time friend Stephen Khou. Things spread like wildfire after that; added to his skate career was a part in Cliché’s Bon Voyage, a shared part in Shanghai Filmer Tommy Zhao’s Something Sinister Video, and most recently, the opening part in the new adidas skateboarding Away Days video. Lucas’ work ethic on and off the board is contagious, so it’s no wonder that adidas has already given him two models already including the beautifully designed adidas Lucas Pro that we reviewed back in 2012. This time around, adidas not only gave us the opportunity to test out the shoe, but also let us host another Weartested Event where we invited 15 local skaters in Shanghai to test out the technical elements of the shoe at 3 infamous spots that Lucas Puig skated in his “Something Sinister” video part. Check out the review below to get our feedback on the newest Lucas Premiere ADV, and watch the video after to see some shredding at Shanghai’s most buttery spots. The Lucas Premiere ADV fits true to size. 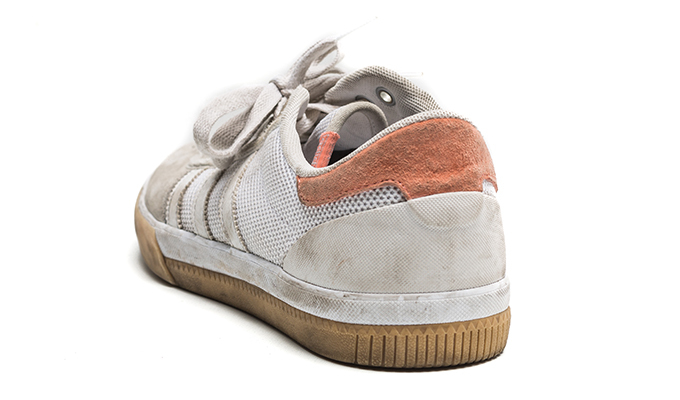 To combat the wear and tear for many of adidas’ tennis and running shoes, the R&D department at adidas developed a new abrasion resistant material to combat excessive wear named adiTuff. This sounds exactly the type of material suitable for skate shoes. 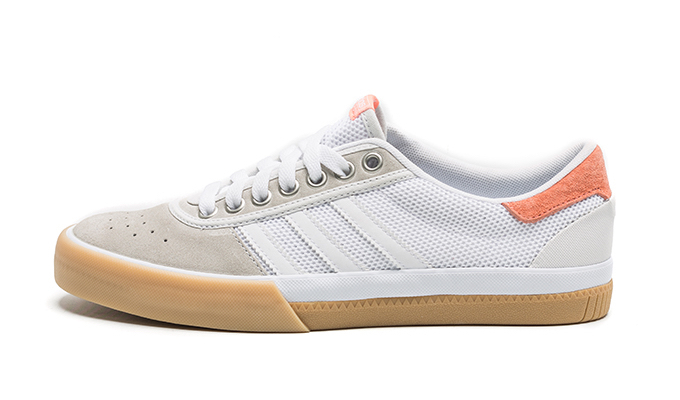 Adidas Skateboarding took notice of that and added this technology with their most recent line of Adi-Ease models. This adiTuff material is also found in the toecap of the Lucas Premiere ADV, which is made of a high quality suede material on the surface, and complemented by an interior layer of coating to strengthen the durability of the shoe. When first putting the shoe on, the adiTuff makes the toes feel extremely well protected from bruising, and after a few sessions, the suede breaks in better without sacrificing the initial toe-cap protection feeling. This is not always taken into account in the toecaps of other shoes, and was quite an appreciative highlight with more time skating in the shoes. With that said, the overall durability of the shoe was fair. The toecap held up fantastic, with the suede material proving to be extremely durable as there were very few signs of wear in the kickflip and Ollie area of the shoe. However, the gum colored sole area of the shoe took most of the abuse, with the material of the gum wearing down quite fast during the first few sessions. Lucas himself skates most of his shoes without an insole, and initially wanted to create the Lucas premiere ADV with absolutely no insole. 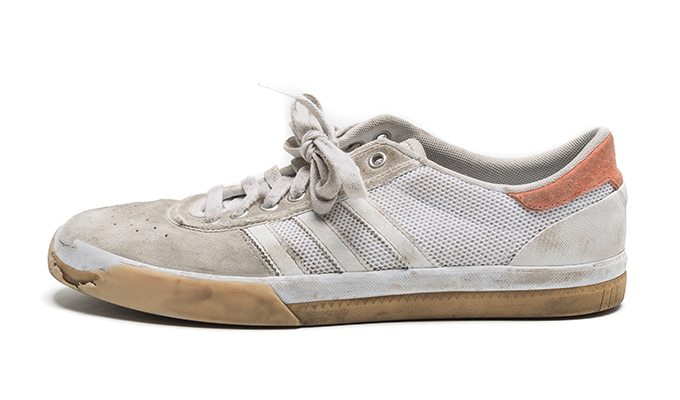 With that in mind, adidas Skateboarding’s main focus of the cushioning features of the Lucas premiere were to make them as minimal as possible. Moreover, by removing excess cushioning, the shoe is much more lightweight and comfortable, a win win situation for those who mostly skate flatground, ledges and low to medium impact spots. The shoe’s cushioning elements are a simple 2-part system: an extremely thin insole resting over a tapered crating midsole, which disperses the impact from landings evenly out to avoid hurting the feet. The two part cushioning system is easy to see in the half cut diagram. The shoe’s cushioning is no problem for low to medium impacts but skating anything bigger than an 8 stair will definitely be a bigger challenge for your feet. The shape of the Lucas Premiere ADV is quite interesting. It looks like a very minimal slim fit shoe, with the slimmest section around the midfoot area. The heel following the midfoot section becomes a bit wider, but not by much. The toecap is actually the widest part of the shoe, which is quite noticeable in the picture of the sole. On the surface, the toecap is not too pointy, and very well rounded; this allows for a wider surface area for abrasion and grip when flick and popping tricks. Not to mention, the toecap is quite sturdy with the adiTuff material so skating is much more comfortable knowing that the toes are well protected. There is very minimal padding around the heel collar, so it seems that the slimness around the midfoot section is really what secures the feet in place. If there was a characteristic of the shoe that Lucas and the team at adidas wanted to focus on with the Lucas premiere ADV, it would the shoe’s boardfeel and grip. 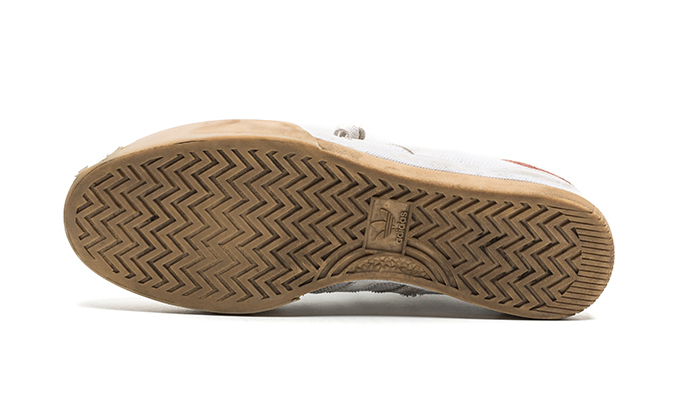 The construction of the shoe is a mix between a cupsole and vulc. From the heel to the midfoot, the shoe features a cupsole construction with the tapered crating system as aforementioned. From the midfoot to the toe however, the shoe features a vulcanized outsole, which is aimed to increase the grip of the shoe. The grip was fantastic; adiTuff helped popping tricks, while the vulcanized outsole helped flick tricks. A nice feature was also the added texture on the outsole of the shoe, which featured a deep-cut herringbone pattern to increase the grip of the shoe. Boardfeel was also a highlight of the shoe. Since the cushioning was extremely minimal, boardfeel was exceptional. Even out of the box, the shoe feels broken into, and also very flexible. There is also a rubber heel cap made out of a treaded rubber composite whose main purpose to is to provide stability, but helps with gripping heelflips as well. Lastly, the sole of the shoe was quite impressive, showing absolutely no blow out spots and proving that there was much more life in them after the 10 hour weartest. Many shoes we review on this website usually has one flaw that isn’t always taken into consideration during the design process: the breathability of the shoe. 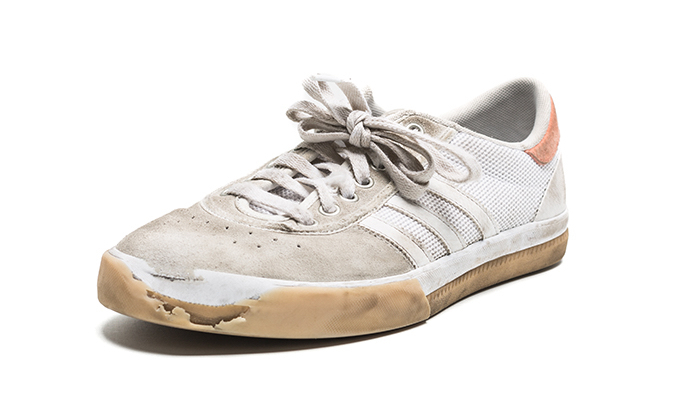 It’s impossible to not get sweaty feet after skating, and sometimes the sweat will affect the performance of the shoe’s durability and material; it happens too often when suede toecaps often get rippled or insoles lose their potential for impact absorption. With the Lucas Premiere ADV, the breathability of the shoe was outstanding, and a breath of fresh air, to say the least. 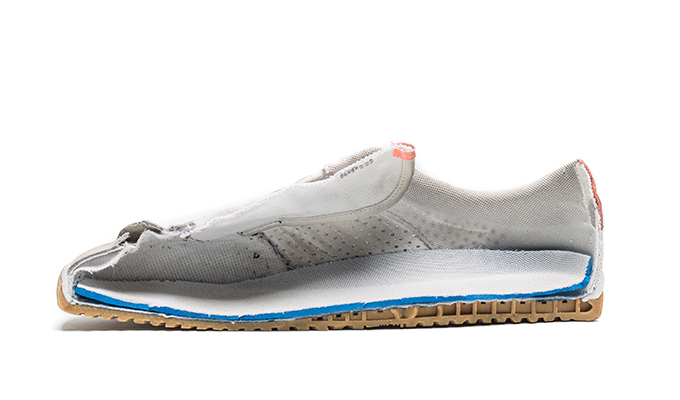 It’s quite hard to find a shoe that is extremely lightweight, breathable, and also stable. But the Lucas Premiere ADV found a way to incorporate all three components by using a very sturdy synthetic mesh material for the sidewalls that spans across two-thirds of the shoe. After a few sessions, the mesh material started to exceed expectations; the mesh did not tear or rip apart, the sturdiness of the shoe did not falter, and no loose seams appeared. When looking from the side of the shoe, it is easy to see through the shoe, and breathable holes that are added into the sidewalls. The tongue of the shoe is also made from the same mesh material and was a nice feature since it stayed in place during the session, and was also very breathable. 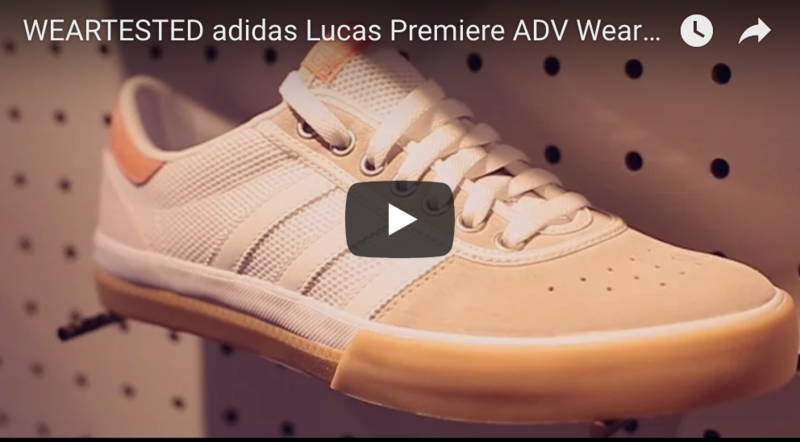 The Lucas Premiere ADV was quite the surprise; although it is a simple low profile shoe, it boasts technicality in boardfeel, grip, and comfort. With that said, small tweaks could be made to improve the cushioning and durability of the shoe.